That's that then for the night. Like Mark Molesley's winning goal, it wasn't pretty but we got over the line in the end. See you all soon. So Aldershot v Rochdale in round two then, that tie will be played on Sunday 7 December. Check out all of the FA Cup fixtures here. Aldershot manager Andy Scott: "We deserved to win. Their keeper made some good saves, we were dominant and we looked stronger as the game went on. The goal was a mess but we don't care how it goes in. "Mark Molesley has scored in the last three games he has played in but he doesn't do anything the easy way." Noel, Southampton: Good to see Aldershot giving Eastleigh and Basingstoke a run for their money as the second best team in Hampshire. The Pompey dressing room is a sombre, stark place. Manager Andy Awford takes a backseat as one of his coaching staff lays into the players. A scruffy goal for the ages! Mark Molesley's scrambled goal is now available to watch. Click on 'highlights' at the top of the screen. Adam Tungatt: What did I tell you? We are an average league two side, nothing more. Our glory days are gone. Portsmouth threw it all away. Peter Collins: That was brilliant. Given what Aldershot have been through the last couple of years, a win tonight meant so much! Aldershot manager Andy Scott: "My voice has gone but I don't care! The players deserve everything they get." 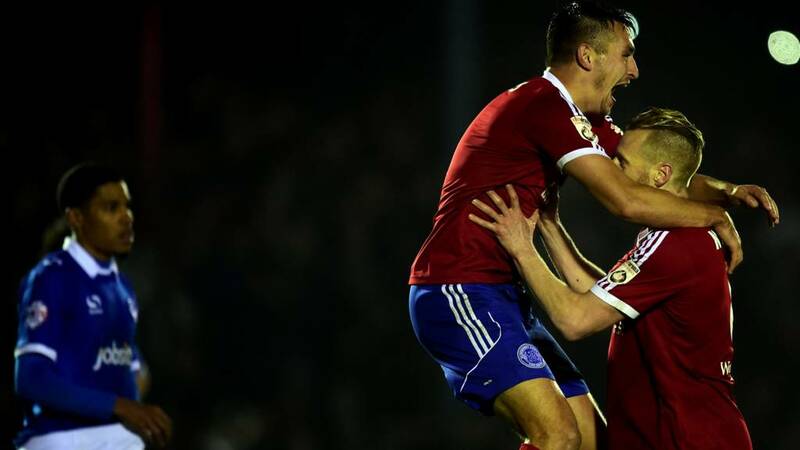 Aldershot midfielder Mark Molesley: "You can see what it means to everyone. The FA Cup gives a lifeline to so many clubs and boy do we need it. It was a gritty performance, a blood and thunder cup tie and that suited us. "I should have scored the header so I was glad to make amends. At half-time we said let's get up and get at them and that's what we did." Huge ovation at the Rec, Mark Molesley's scruffy goal is enough to knock out the 2008 FA Cup winners! FOUR MINUTES added on. The Conference side are almost there. They can smell a clash with Rochdale. Aldershot five minutes away from an upset. Can they hang on? Pompey throw on lower league stalwart Patrick Agyemang. All or nothing now as Jed Wallace fires over from 25 yards. It's in there! One to tell the grandkids about as Mark Molesley scores what could be the winner! It's as ugly as goals get, a real stinker, as a corner is headed on, a Portsmouth shirt gets a head to it. It's now all Aldershot. Kieron Forbes beats two men with a mazy run but his shot is blocked and then Manny Oyeleke curls way wide from the edge of the area. He's played for England against Brazil, but he still knows how to clear a goalmouth scramble! Aldershot so close to the winner after a right old stramash in the penalty area, Dan Holman tackles the keeper, the ball is bobbling towards the net but Nicky Shorey reads it, even having time to sidestep an attacker and hook it out! BBC Radio Surrey commentator Gavin Denison: "The game has really opened up in the last five minutes. Two Aldershot chances but still 0-0." The game beginning to get stretched now, some tired legs out there. Jack Whatmough goes into the book for a challenge on halfway, he looks goosed. That's more like it! Aldershot do raise it, striker Brett Williams cracking in an early daisy-cutter which forces Paul Jones into a strong one-handed stop down to his left. The corner is not cleared too well and Manny Oyeleke blasts wide from 20 yards. Adam Tungatt: Not so long ago, Portsmouth were on our way to Wembley with famous wins against Man United. Now we struggle against Conference teams. Tackle. Foul. Tackle. Foul. Poor touch. Foul. Tackle. Header. Clearance. Tackle. Foul. It's all a bit scrappy. Raise it! Into the last 20 minutes. Aldershot keeper Phil Smith juggles with the ball but he gets away with it. Both managers are readying replacements. Time to be the hero? What a chance! The best chance of the night for the hosts as Mark Molesley meets a teasing right-wing cross, it's at an awkward height, he goes for a flying header and puts it three yards wide. Unlucky. Scott Simpkin: Just to let you know, typical Aldershot is we hold out until the last 10 minutes then lose 1-0. I hope I'm wrong tonight! Into the last half hour. Any one for goals? I'm sure those aren't quite the lyrics to the chant in the away end at the Rec, but that's what it sounds like. Do it for Colin. Do it for John. In reference to Pompey defender Jack Whatmough [33 mins], who has the best hair in football? Chris, Herts: Best hair? How about Edgar Davids' Barnet? How Portsmouth could do with just one of their 2008 FA Cup winning side now. Even Kanu. The game is crying out for some quality. The League Two side need to get Ricky Holmes back on the ball. Aldershot win a free-kick. Is this the route to Round Two? Nope. Well cleared that man. Sporting falls from grace. Hmm. Jason - in a roundabout way you are describing League One as what exactly? Another penalty shout for handball, Pompey on the claim this time. Ryan Taylor lifts the ball up in the area, it appears to strike the hand of Joe Oastler but referee Stuart Attwell is unmoved. That's one shout each. Nothing given. Oooh controversy! Pompey midfielder Jed Wallace has the ball in the net, but the offside flag has long since been raised. However, a replay suggests that Wallace was well onside. He should have been able to play on there. Aldershot get us back under way. Goals? Goals? Let's face it - this is going to penalties isn't it? We may as well get used to the idea now. But have you seen this brilliant penalty from South Korea? South Korean K-League champions Jeonbuk Motors secured a 1-0 win over Pohang Steelers thanks to an unconventional penalty routine. Instead of shooting, penalty taker Leonardo passes the ball to team-mate Kaio who rolls the ball into the net to seal the win. The Brazilian duo successfully pulled off the cheeky routine, unlike Arsenal duo Robert Pires and Thierry Henry who spectacularly failed in 2005. If there are no goals in the second 45 minutes, we are looking at extra-time and then (potentially) spot-kicks. Nobody wants that. Matt from Chandlers Ford: Good first half from Pompey and Aldershot starting to get back into it. Looking forward to the second half. Half-time, no goals. One brilliant save. There's nothing more frustrating for a centre-half than trotting 60 yards up the pitch for a set-piece, and the ball then being overhit and out of bounds. That's what just happened to the Pompey lads. Not happy. Aldershot have a strangled penalty appeal waved away, and moments later home keeper Phil Smith has to be sharp to get off his line and push the ball away as Pompey launch a counter. That injury delay has taken all of the gas out of the game. Both sides seem to be limping toward half-time. It's the end of the night for Aldershot defender Chris Barker. He is down with what looks like a muscle strain, and Naby Diallo is on in his place. I keep mentioning Portsmouth defender Jack Whatmough and his fine head of hair - here he is playing for England U18s. Like a young Jurgen Klinsmann crossed with Scottish rugby player Richie Gray. Whatmough has another chance! He misses his kick but he makes a nuisance of himself. We asked for your greatest sporting falls from grace - and Leeds United are certainly up there. Aldershot defender Chris Barker - brother of former Portsmouth boss Richie - gets away with a blatant handball! The free-kick is eventually given but somehow he is not booked. Portsmouth almost take advantage from the free-kick as the distinctive Jack Whatmough hooks a shot wide. Aldershot now coming back into the game - end-to-end FA Cup magic so far this evening. What an effort! A strike worthy of a far higher level as Jed Wallace throws himself into stunning scissor-style volley - think Gus Poyet v Sunderland all those years ago - brilliant feet. His technique is only matched by the athleticism of Aldershot keeper Phil Smith, who makes a one-handed save right out of the top drawer. Don't bother searching the archives Peter - IT HAS NEVER HAPPENED. Peter Collins: I can't remember the last time my beloved Aldershot had a live feed to themselves... COME ON YOU SHOTS! Ricky Holmes looks the man most likely to break the deadlock, the Pompey winger spinning away from a defender to get a shot in, it's well blocked and Ryan Taylor's follow-up is horrid. Again, Aldershot counter well and win a corner. The Conference side have settled well after that rapid start from Pompey, holding their own in midfield now. Former England international Nicky Shorey gets forward for Portsmouth but that man Jaydon Gibbs sticks with him. Chance for the Shots! Defender Joe Oastler gambles to win a flick-on at the near post, he hammers in a shot but Jack Whatmough throws himself at the ball to turn it over the bar. Open game so far. Aldershot right-back Jaydon Gibbs is the twin brother of England left-back Kieron and shows some genetic pace, burning down the wing to carry the counter-attack. The ball comes left, Brett Williams turns well but it comes to nothing. That's three excellent crosses already from Portsmouth winger Ricky Holmes. Again the vast blonde mop of defender Jack Whatmough is up there attacking the ball, but this time he can't connect. All Pompey so far. Portsmouth go close again! What a start, frantic defending from the Shots as Ricky Holmes can't force the ball in at the far post. The League Two side hitting top gear. Pompey boss Andy Awford said that he wanted this tie put to bed as soon as possible and they almost score in the first minute. Ricky Holmes' free-kick is deep, Jack Whatmough wins the header and it's cleared off the line! A banner reading 'Against modern football' is hoisted high in the stands behind the goal. Old-fashioned rough-and-tumble stuff will do us tonight. A chilly, visible-breath sort of night in Hampshire. Almost game time at the Rec. A reminder that the winner tonight faces Rochdale in Round Two. We could have extra-time and penalties this evening, though I have to say that I'm all for Andy Awford's plans to put this tie to bed one way or the other inside the 90 minutes. Danny from Epsom: Come on you Shots! Time to give this 'Portsmouth' team a footballing masterclass and set up mighty tie with Rochdale! Chris from Esher: Aldershot can win this, we've got to the 4th round in 2012 I'm sure we can get there in 2014! COME ON YOU SHOTS! on the BBC Sport website and app. As Portsmouth look back on winning the Cup just six years ago, we asked for your suggestions of other falls from sporting grace. Thomas Duke: Bradford Bulls, World Club Champions in the early 2000s, relegated last season. Matthew Fiford: Marion Jones won all those medals at Sydney Olympics in 2000, ends up in jail. Portsmouth manager Andy Awford: "I was the youngest player to play in the FA Cup a long time ago! This is a magical competition. We've been fortunate to win it and get to finals in recent years but we are where we are now. "We are a League Two club. The mission is to get into the hat, nobody wants penalties, we want to win this tie and put it to bed in 90 minutes." Around 40 miles and one division separate the two clubs in action this evening - can the Shots cause an upset? Manager Andy Scott thinks so He says: "It's been a difficult two years but it's nice to have the cameras here this evening. "We played really well in the first game and went ahead - we just couldn't hold on. Confidence is high and we will give them a good game." As an added bonus this evening, you will be able to see the goals from this game within minutes of the ball hitting the net. Keep your eyes peeled on the 'highlights' tab for videos of the latest action. It's looking particularly chilly at the Rec this evening. Will the Portsmouth lads be up for the fight? "We are going to have a near sell-out, which is a fantastic effort from everybody really and shows what the feeling is around the place. "You want to be involved in the big games with the big atmospheres. This is a reward for saving the club and goes to prove there is life in us yet. "We want to put on a good show and show how good we are as a group. "Although it can't exactly be classed as a Cup run yet, the finances have massively boosted us and it has given the players confidence." Dave from Aldershot: Come on you Shots! Fancy Aldershot to sneak a cheeky win here, I've never even heard of Portsmouth. If my words aren't enough for you you can join BBC radio 5 live sports extra for full commentary from 19:40 GMT. Listen online, on your DAB set or in this page. there were plenty of replays last night. Non-league Southport reached round two for the first time since 2002 by upsetting League Two Dagenham & Redbridge, while fellow Conference side Telford beat Basingstoke to progress. Conference South side Concord Rangers also drew 1-1 at League Two Mansfield - 44 places above them in the football pyramid - to force a replay. on the FA Cup index. From Cup winners courting Peter Crouch and Jermain Defoe to roughing it out with the non-league lads in six short years. Portsmouth's slump is enough to test the patience and sanity of even the most committed fan. But what are sport's biggest falls from grace? Who had it all, the world at their feet, only to spectacularly bin it? Sometimes through no fault of their own. As if Portsmouth's slide down the rungs of the footballing ladder wasn't painful enough, they may not even be favourites tonight. the 2-2 draw in the first meeting at Fratton Park. The Shots will fancy another home win tonight. Three changes for Aldershot from the team which beat Nuneaton. Mark Molesley, Jaydon Gibbs and Jordan Roberts return to the starting XI. Portsmouth make four changes from the side thumped 3-0 by Plymouth at the weekend. Paul Robinson, Nigel Atangana, Ryan Taylor and Craig Westcarr are in. Portsmouth have not won an FA Cup tie since the 2010 semi-final win over Tottenham. Their reward for that win was a final berth against Chelsea. They say a week is a long time in politics. Try a few years in football. Portsmouth won the FA Cup. A team managed by Harry Redknapp containing Kanu, David James, Glen Johnson, Pedro Mendes. Sol Campbell. Niko Kranjcar of course. Always Niko Kranjcar. Since then? If you are fond of drastic understatements you could say things have been tough. Redknapp left, the money soon after. Tony Adams, Paul Hart, Steve Cotterill, Avram Grant, Michael Appleton, Guy Whittingham and Richie Barker have been in and out of the hotseat.